I got this pretty lame, dull envelope in the mail today, and the sender was Square Enix. 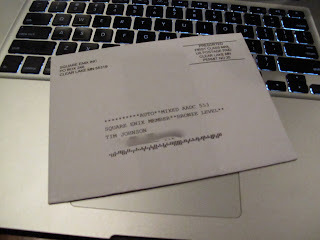 In the recipient field, it addresses itself to me, Mr. Square Enix Member, Bronze Level. Square Enix's version of Club Nintendo, MEMBER, has started to ship out the rewards, and, being a MEMBER solely because I registered Final Fantasy XIII, I was entered into the Bronze category, and I got a paltry set of post-cards. However, they're adorned with artwork from 3 different games: Final Fantasy XIII, Kingdom Hearts: 358/2 Days and Star Ocean: The Last Hope. None of them seem to be screaming anything back at me, but the art is pretty decent. Check out more shots after the break.